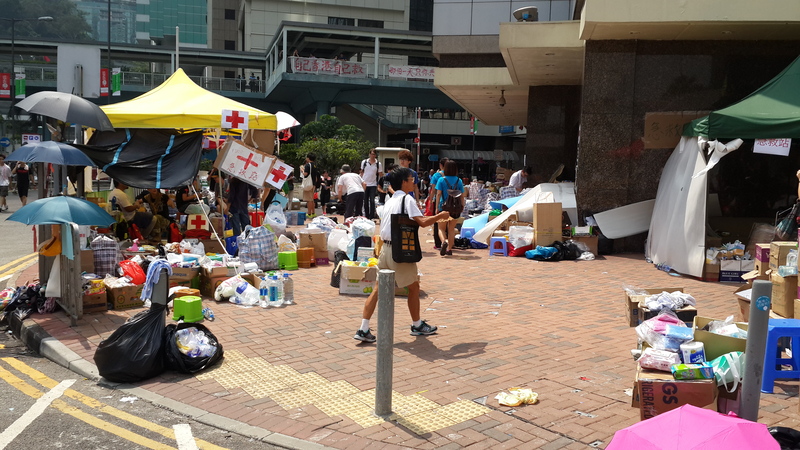 This is a remarkable revolution and although there are a few older leaders associated with the movement, the overwhelming impression on the streets is of a protest organized and led by the young, mostly students in their teens and early twenties. They are all polite, disciplined and determined. 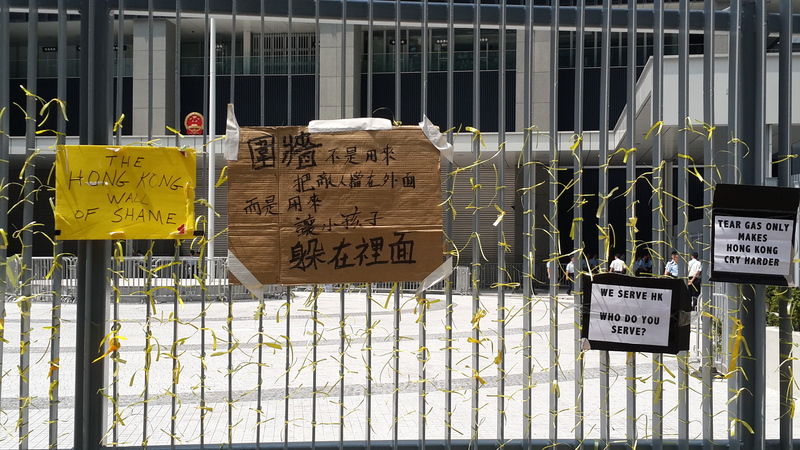 Meanwhile, many of the older generation, the parents and grandparents of the youth on the streets, remember the wrath of Beijing in 1989 at Tiananmen Square, and tremble at home in fear. On Day 2 of the demonstration, a remarkable thing happened. The police over-reacted to the peaceful demonstrators and tried to clear the field using tear gas and pepper spray against the young people. 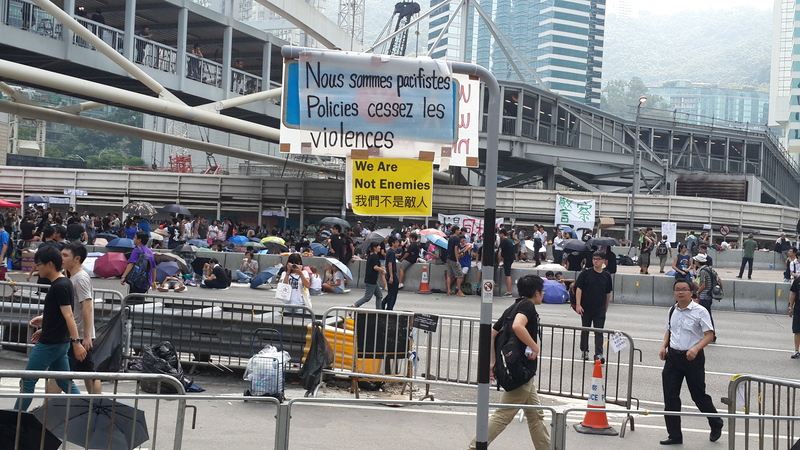 Within hours, many of these cautious older people were out on the streets, protesting the use of force against their children. I spoke to a well-dressed young woman, who was among the demonstrators. She said she left her office from time to time during the working day and joined the crowds for an hour or two in a gesture of solidarity. A few companies apparently gave their employees tacit approval to join in the demonstrations if they wished instead of coming to work. Let’s hope for all our sakes that the people calling the shots in Beijing, the President and members of the State Council, do not follow in the footsteps of their predecessors in 1989. According to tradition, Thomas landed on the Malabar coast, where his skill as a carpenter won him the favour of the local king. He was allowed to preach the Gospel and convert believers to Christianity. Thereafter, he moved across southern India for the next 20 years before he was finally killed near the coastal city of Madras, present-day Chennai, in AD 72 apparently because a local king grew jealous of his increasing popularity. Marco Polo, writing in the 13th century, states that the apostle was accidentally killed by a bird hunter who was shooting at peacocks in Mylapore. More recent interpretation of inscriptions found on the Pehlvi cross, near present-day St. Thomas Mount, by the Portuguese in 1547, suggest that the legend of Thomas’ martyrdom was based on mis-translations of the middle Persian script. Whatever the truth of the Apostle’s death, at this point in time, the legend of his martyrdom has been firmly established to a degree that makes it a fact, and there is a basilica built on the site of the tomb at San Thome, one of only three in the world directly associated with the 12 Apostles. (The other two are St. Peter’s in Rome, and Santiago de Compostela in Spain, dedicated to James). Since India is a land of syncretism, the tomb and St. Thomas Mount have been a pilgrimage site for Christians, Hindus and Muslims since at least the 16th century. The Indian church has adapted in India and adopted some of this syncretism by introducing certain Hindu rites (such as the tying of the thali at weddings). 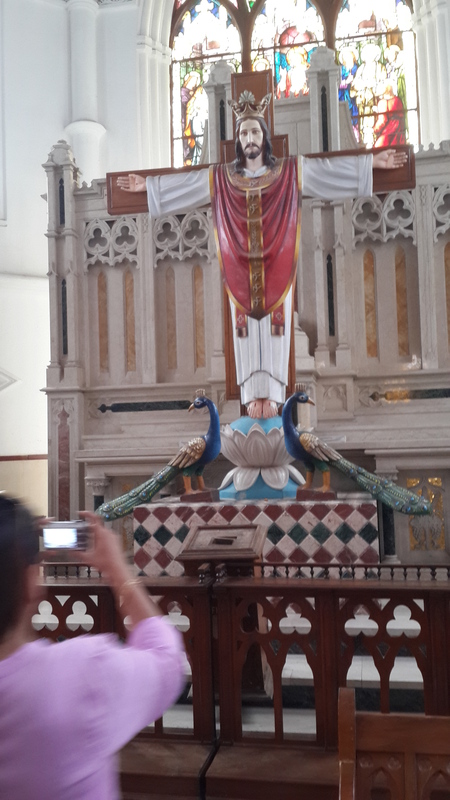 Knowing this, one is not surprised to find that the image of Christ on the cross at the cathedral of San Thome is flanked by two peacocks and that his feet rest on a lotus. The area around the San Thome basilica belonged to the ancient city of Mylapore, or the city of peacocks. 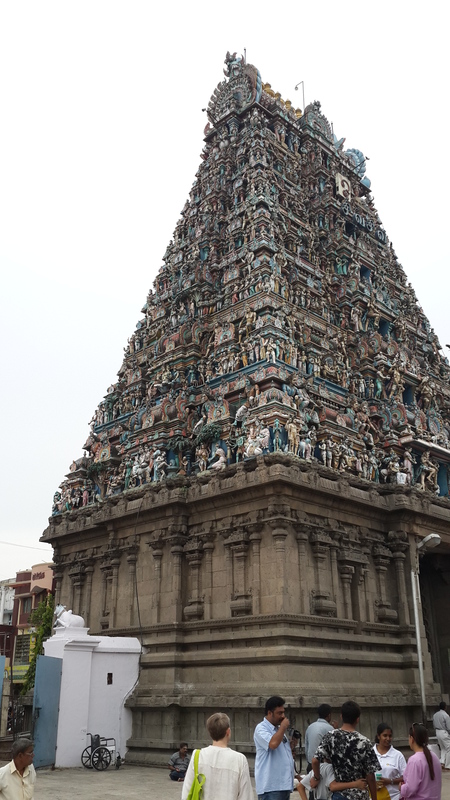 A temple was built in the 7th century AD in Mylapore. According to legend, Shakthi, the divine embodiment of the female, worshipped Siva in the form of a peacock, giving its Tamil name (Mylai) to the city. The temple was built to commemorate this, and is dedicated to Siva. Inside the temple is a statue of Nandi, the bull, which is Siva’s favourite mount, and also a gatekeeper to Siva and his consort Parvati. 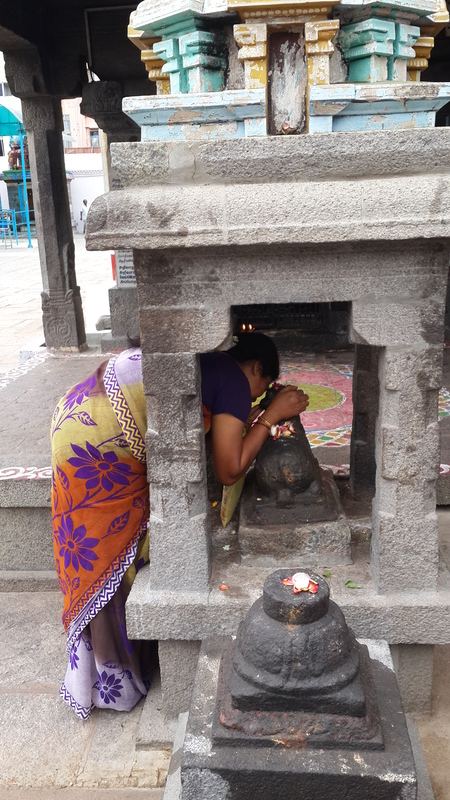 For this reason, it is believed that whispering one’s secret wishes in Nandi’s ear is as good as a direct request to Siva himself. William Dalrymple, in his fine book “Nine Lives” writes about the Phad singers of Rajasthan. As in traditional arts and crafts everywhere, the few remaining Phad singers and puppeteers are struggling to find audiences and sustain their livelihoods. There is a great danger that these rich traditions will soon be lost. Performances for tourist groups can help these artists survive, but to be really appreciated, the audiences need to be educated about the background to these stories (which are well-known to most traditional rural audiences) and this happens only with the most knowledgeable tourists, such as academics or researchers studying language and culture. The Phad is a religious scroll painting of deities, a kind of a portable temple. 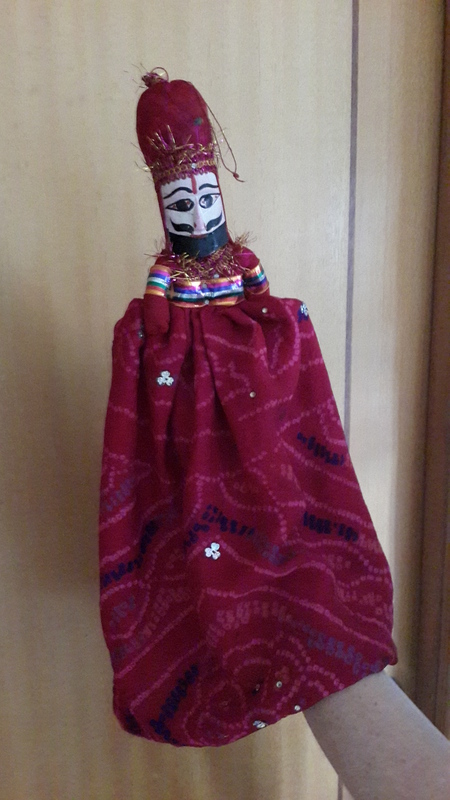 As representations of the divine, these Phads, or painted scrolls, are treated with great reverence by the Bhopas (traditional singers) who carry them from village to village and fair to fair. The bhopas are bards, singers of epics, and perform prodigious feats of memory. 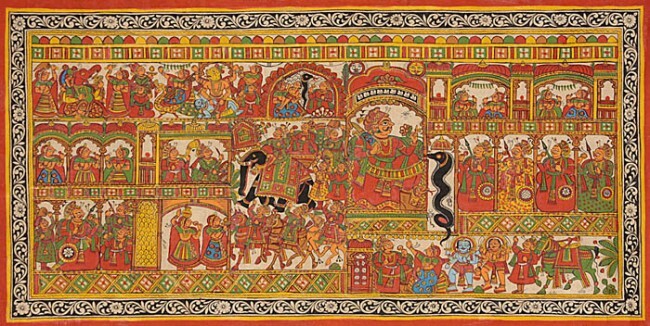 The most popular epic is that of Pabuji. In the old days, when this 4000 line courtly poem was recited from beginning to end, something that rarely happens today, it took a full five nights of eight-hour performances to complete the narration. 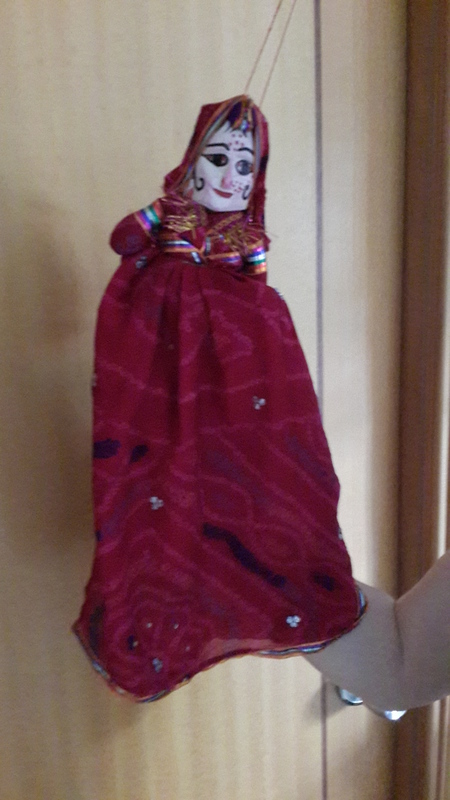 The art of the bhopa was handed down in families, from father to son. Sadly, the bards with their traditional accompanying musical instruments, called Ravannahatta, are disappearing from both town and country today. Another dying art tradition is that of puppetry performances. Scholars believe that the tradition is thousands of years old. 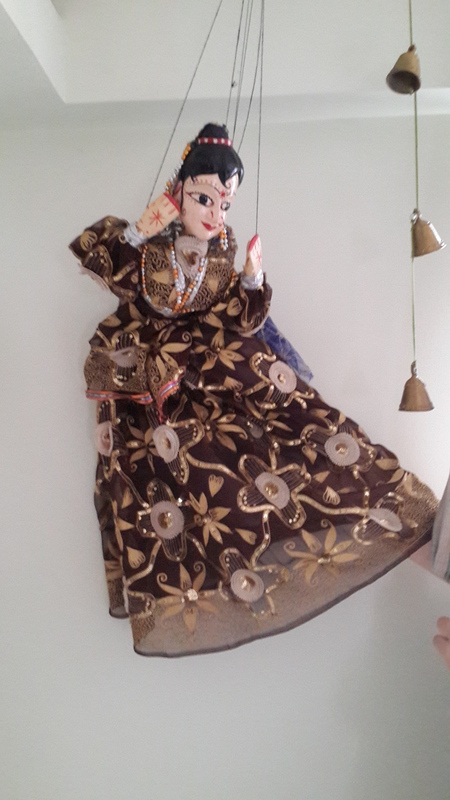 The puppets are called “kathputli” and fashioned from fabric, wood, wire and threads. In a desperate attempt to attract foreign tourists, puppeteers have “dumbed down” their elaborate plays based on the classic Indian epics, and developed contemporary five-minute local variations that neither do justice to the original, nor do they attract the tourists as they are meant to do. As Janis Joplin presciently sang in the 1960s, the sentiment behind Lord, can I have a Mercedes-Benz and the pursuit of material wealth has eclipsed the spiritual quest even in this land of 33 million gods. 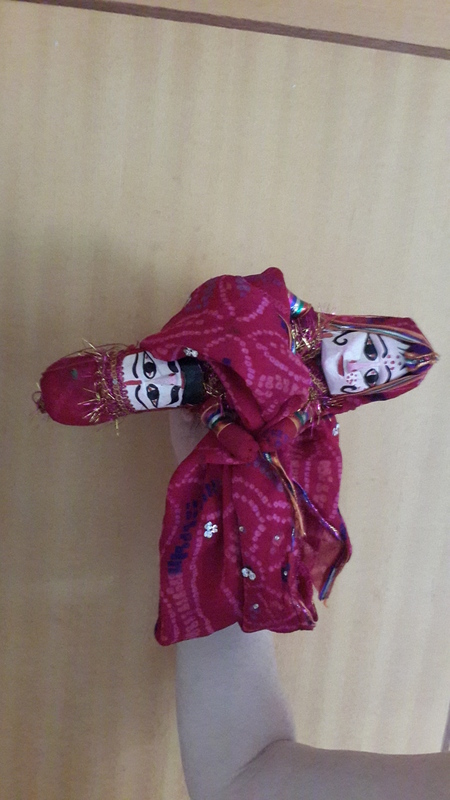 * There are several standard figures in the line-up of modern Rajasthani puppets. One of them is called Anarkali, who is modelled as a temptress and courtesan. The second standard modern puppet figure is a Rajasthani version of Michael Jackson, who struts his stuff on the portable wooden stage and manages a passable moonwalk. The highlight of this 2-minute skit is when he raises his detachable head. The third modern set piece is a snake charmer and his cobra, which begins to chase him around the stage after initially swaying to the charm of the flute in the background. Another character who often appears is a demure bride who suddenly is flipped over and becomes a male singer. 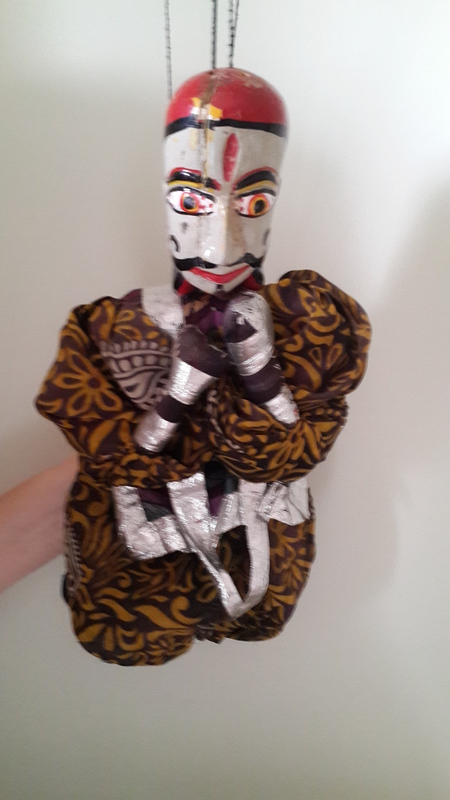 Sometimes these puppets are handled with considerable skill, all the while accompanied by an ektara, a single stringed violin, and a shrill-voiced male singer who speaks through a bamboo reed. …or a bit of both. *The figure of 33 million was pulled out of a hat after many discussions of the number of gods, where the count ranged from 3000 to 330 million, the last figure based on the reasoning that almost every third person in the country has his or her own personal deity. 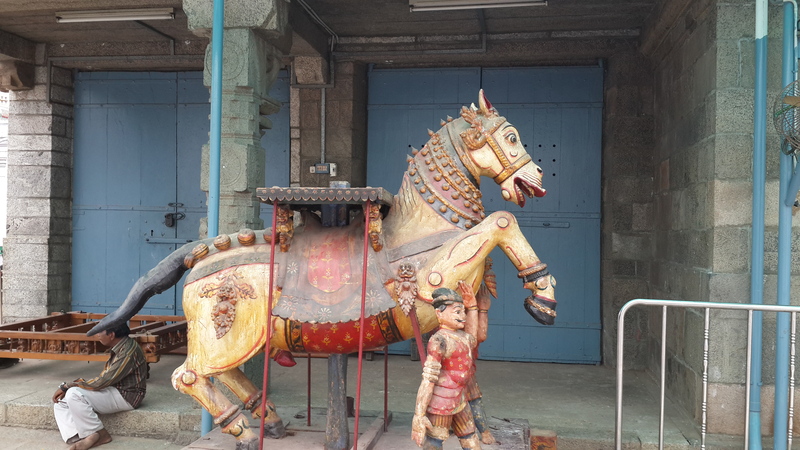 This seemed rather far fetched, but it is true that in every small village and town there are local version of the principal gods and lesser deities of the Hindu pantheon. If it all seems too foreign and confusing, look at it this way. There is but one god, Brahma, the creator of all things, and all the numerous deities are but one way of approaching him, just as Catholics pray to their favourite saint to intercede for them before the one God. 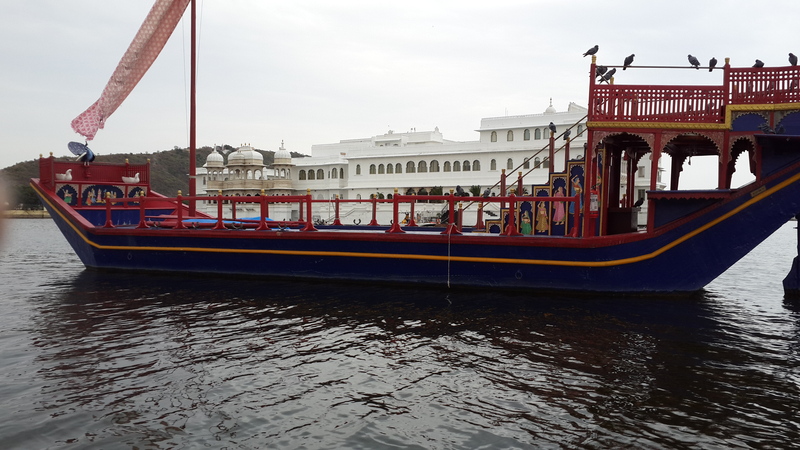 Udaipur is one of the must-see cities of Rajasthan, for its iconic Lake Palace situated in the middle of Lake Pichola with its grand series of stone and marble palaces that have been successively added along the shores over centuries. 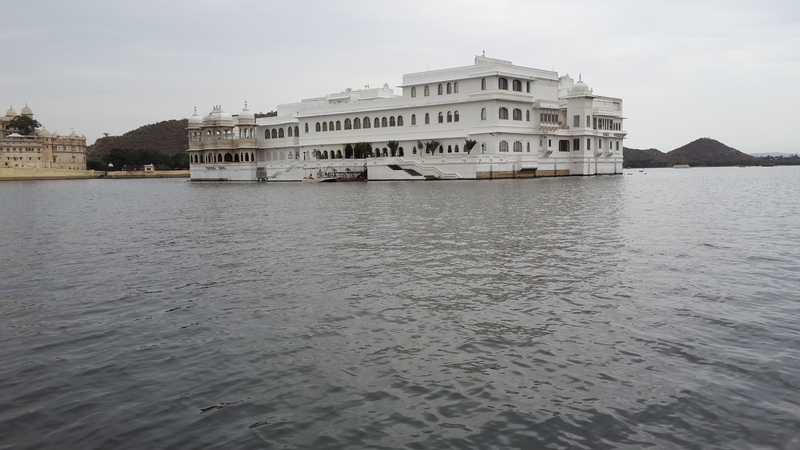 Udaipur’s royals belong to the longest unbroken line of rulers in the world, having endured for more than a millennium. 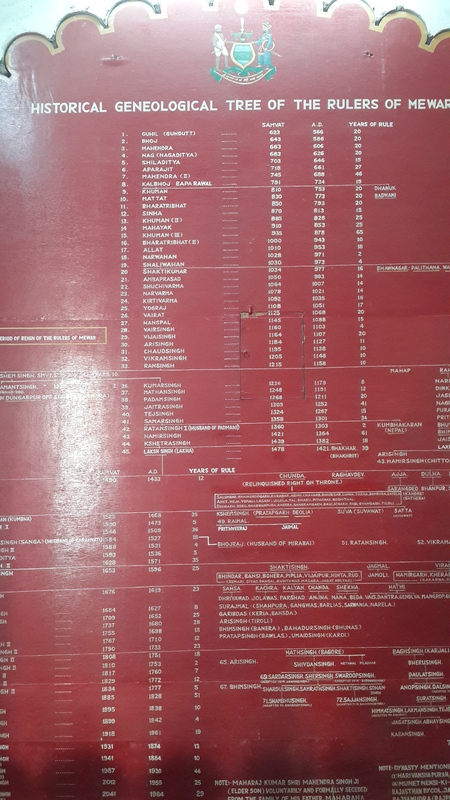 The present-day city was founded in the 1530s at around 1000 feet above sea level, close to the cooling influence of the Aravalli range of hills. The aboriginal hill tribes of the Aravallis, the Bhils, were traditionally self-sufficient hunter-gatherers and good archers. Bhil tribesmen assisted Rajput troops in their periodic wars against Mughal armies, and for this reason, the Mewar coat-of-arms portrays both a tribal armed with bow and arrows and a Rajput warrior flanking the shield with a fortress in the middle. 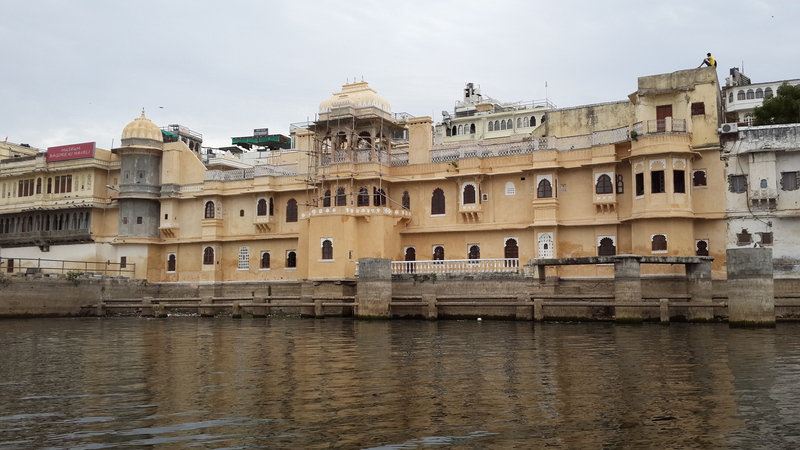 The lake dries out occasionally when there is a succession of bad monsoons, but a project is underway to ensure a steady inflow and expand the rainwater harvesting systems that were installed in the palaces from the 17th century onwards. 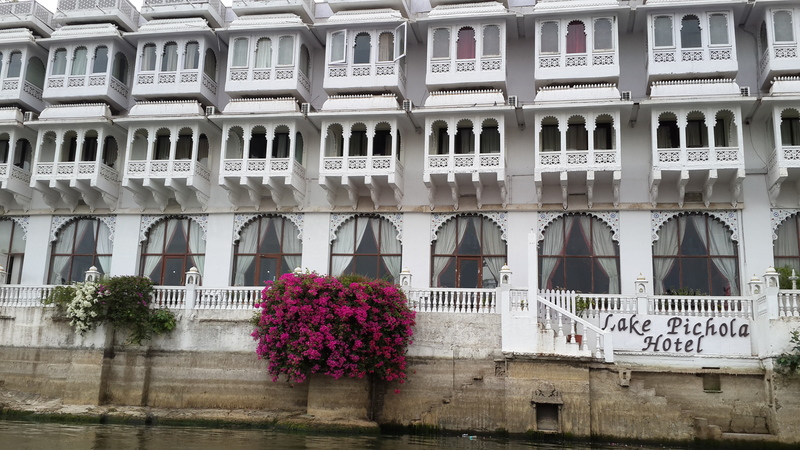 Nowadays the royal barge is only for decor or the occasional VIP hotel guest. 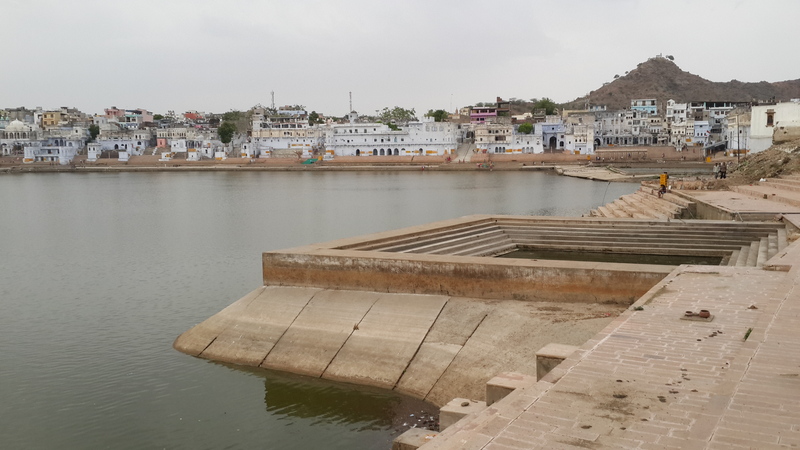 Pushkar: a holy lake of tears. 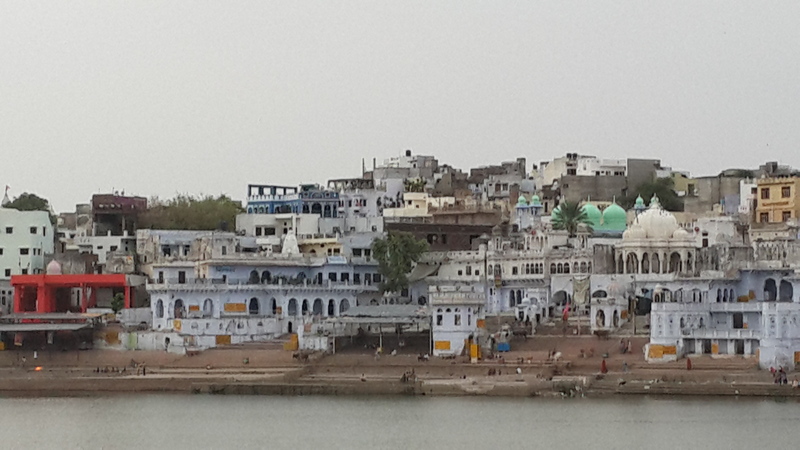 Pushkar is one of the holy places for Hindus in India. There is a temple to Brahma in Pushkar, a rarity. There are only six temples dedicated to Brahma worldwide and this is considered the most important. There are several beautiful stories associated with the reasons for Pushkar’s sanctity. One has it that Siva’s wife Sati was insulted by her father (this is a long story in itself, see the URL below for more) and literally burned with shame. Siva was so overcome on hearing of the death of his wife that he wept inconsolably. 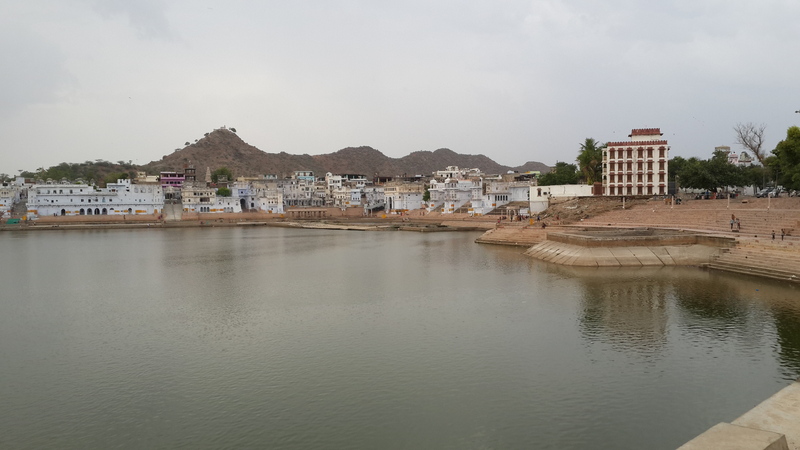 The pools formed by the tears from his two eyes are the lake at Pushkar and the Katasraj temple lake about 300 kilometers away that lies today in Pakistan’s Punjab province. 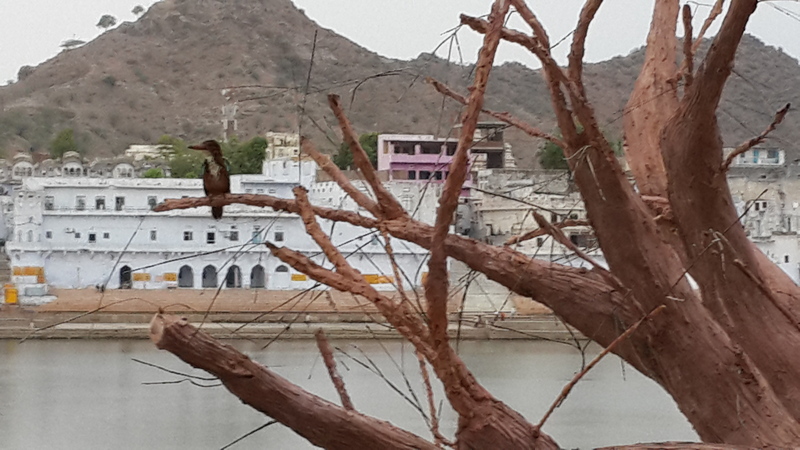 There is another story about the reason for Pushkar’s spiritual significance. In this, Brahma saw a demon named Vajranabha killing people, so he killed the demon with a divine lotus flower. In this process, the petals of the lotus flower fell to the earth and formed the lake. Yet another story tells of a mortal, a Rajput king, following a wild boar down to the lake during a hunt. He stopped to quench his thirst and found that dipping his hand in the lake had cured his leukoderma. Whatever the reasons for its perceived sanctity, the town exudes a certain contradictory bustling calm and the lake itself is surrounded by temples and bathing ghats. The biggest attraction for tourists is the annual 5-day camel fair where livestock are bought and sold. 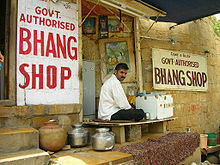 Our tour guide showed us around the impressive Mehrangarh fort and indicated the blue-washed houses in the valley below. All those blue houses, he said, belong to Brahmin families. Further enquiry found many other explanations for the blue coloring, so the jury is out on this one. Other possible reasons: as in the case of imperial yellow in Austrian Habsburg palaces, the color could have been chosen because it was the least expensive. Whatever the real reason, Jodhpur is commonly described as the “blue city” of Rajasthan and, together with Jaisalmer and Jaipur, make up a trio of colored cites in the state. 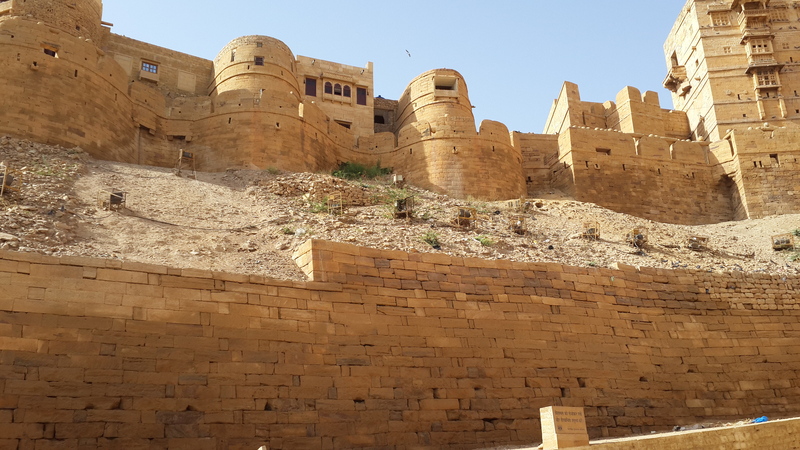 Jaisalmer really is a golden city; golden sands of the Thar desert that spread from its outskirts and the golden sandstone of which the city is built. 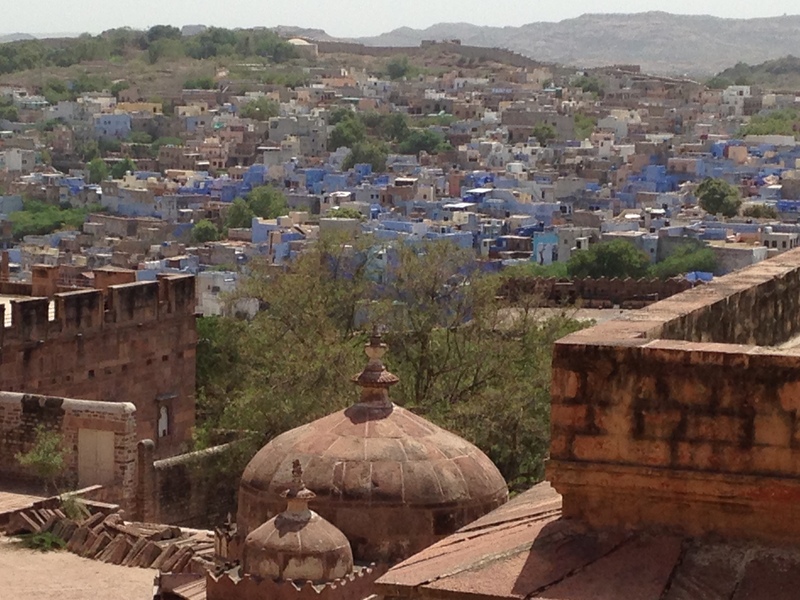 Seen from the fort, the city of Jodhpur is speckled with blue, the afore-mentioned allegedly brahmin houses. Jaipur is called the pink city mainly because of the iconic Hava Mahal, and because its royal family preferred the colour on all their buildings. 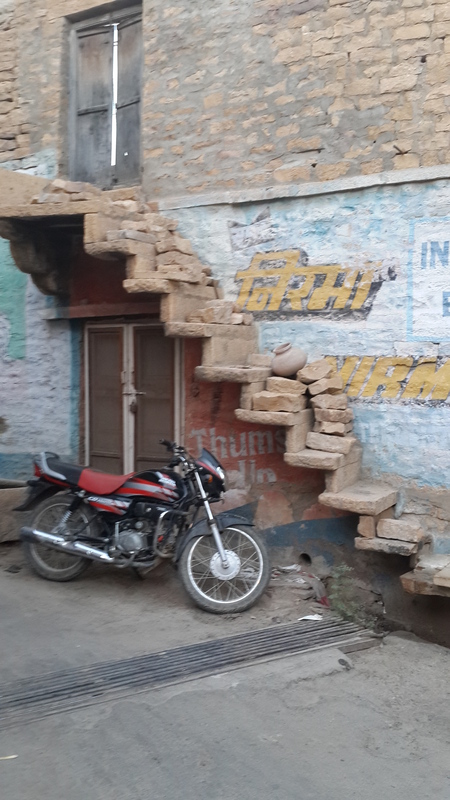 But in today’s Jaipur, bustling with handicrafts and industry and bursting at the seams with people, the pink color is lost unless one wanders among the historic buildings and older parts of the city. Mehrangarh fort in Jodhpur is probably the most impressive in Rajasthan and well worth a visit of 2 or 3 hours (there’s more than three hours worth to see if you can take it in at a stretch), from royal palanquins to a beautiful collection of swords, and finery worn by royalty in centuries past. A tip: the audio guides available in the fort are excellent and provide concise commentary at every important object on display. In addition to its blue-painted houses, the dominating fort, and riding breeches named after the city, Jodhpur was also famed for its Marwari horses. They are a hardy breed with distinctive ears that point towards each other. They have a regal gait and are descended from local ponies interbred with Arabian and Mongolian horses beginning in the 12th century.Close to Jodhpur lies Mihir Garh, a boutique hotel with only 9 rooms that Lonely Planet listed in 2014 as the most unique hotel in the world. A well-paved road leads from Jodhpur to Udaipur, again a city named after its founder Udai Singh in the 1530s, although this dynasty has ruled in the area for more than a thousand years, and represents the world’s longest unbroken ruling line, from the 9th century to the mid-twentieth. 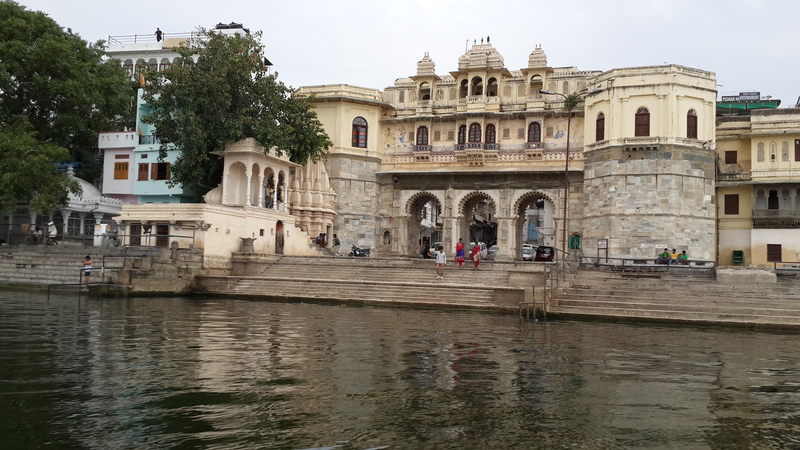 More on Udaipur and Pushkar in the next post. 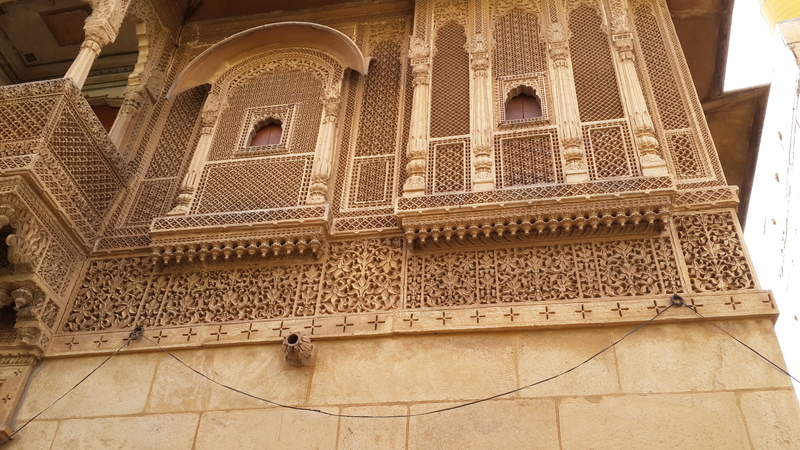 Jaisalmer was an important node in the overland silk route and well-connected to the world at the time of Marco Polo. Built from the local yellow sandstone that turns to tawny gold in the evening sunlight, its fortress dominates the landscape, rising with crenellated walls several hundred feet above the surrounding plain. From the 12th century, it was a flourishing trade post for nearly 700 years. Camel trains brought Damascene swords, Afghani carpets from Herat, Persian wines from Shiraz, and “green-eyed Circassian beauties headed for the harems of Hindustan.” The last denominated may be a catch-all term for women from the trans-Caucasus region of Eurasia. The most famous Circassian of all is probably Roxolana who, as Hurrem Sultan, rose from slave to concubine to favourite wife of Suleiman the Magnificent (1520-1566) and ultimately, one of the most powerful figures in his court. Roxolana was actually of Ukrainian or Ruthenian descent, but the wife she ousted from Suleiman’s favour, the beautiful Gulbehar, was undoubtedly Circassian. Contrary to legend, Marco Polo did not visit Jaisalmer. Perhaps he should have. 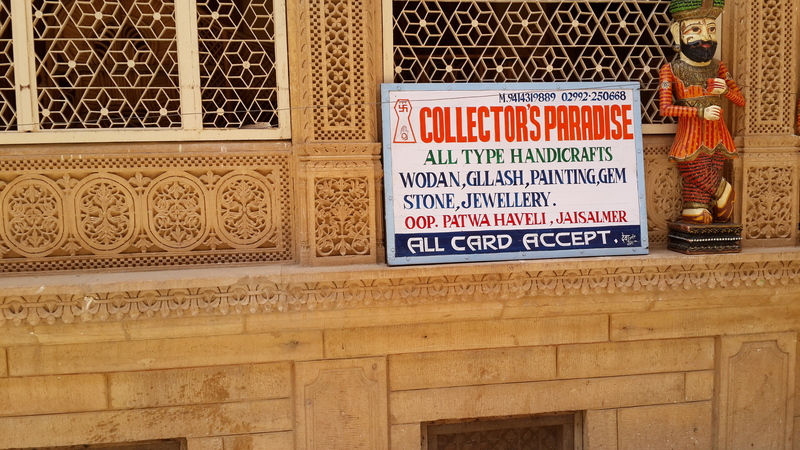 Today, as it did then, Jaisalmer gleams like a golden mirage at the edge of the Thar desert. Approaching the city from the north-east, from the direction of Bikaner, there is endless sunlight and more golden sand. Passing Pokran, the site of India’s first nuclear test in 1974, there is an array of hope for the future, rows of photovoltaic cells that are part of a 40 MW plant set up in 2012 to provide power to Rajasthan state. NOTE: Click on images below for larger view. There is something easy-going about the pace of life in the city, unusual in that it is the first inhabited monument in the world to have been declared a World Heritage site in 2013. 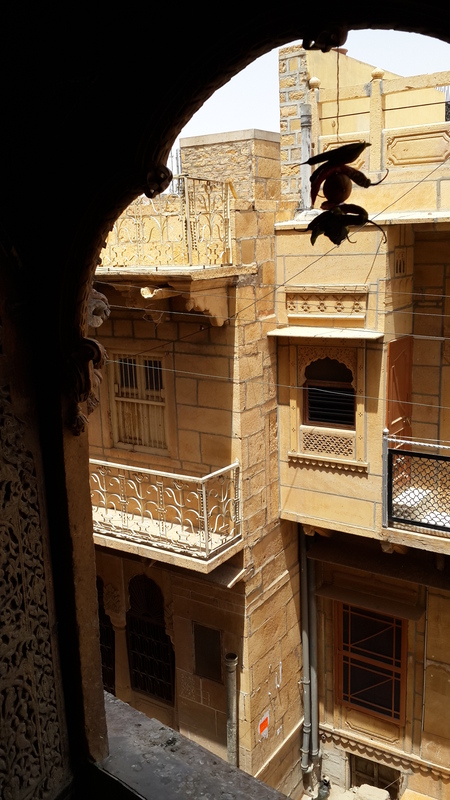 Around 450 families reside in the fort complex and some of their homes have been converted into hotels, which puts additional strain on the centuries old infrastructure that was designed for a royal household and a few hundred retainers. After a walk around the city lasting several hours, we were totally captivated by the relaxed atmosphere in the city and found a possible explanation when our guide offered us a choice of masala chai or a glass of milk or tea laced with bhang. When asked if it was legal, he turned and pointed to a sign down the street. The offer was tempting, but deterred by the 40-degree heat, I regretfully declined. 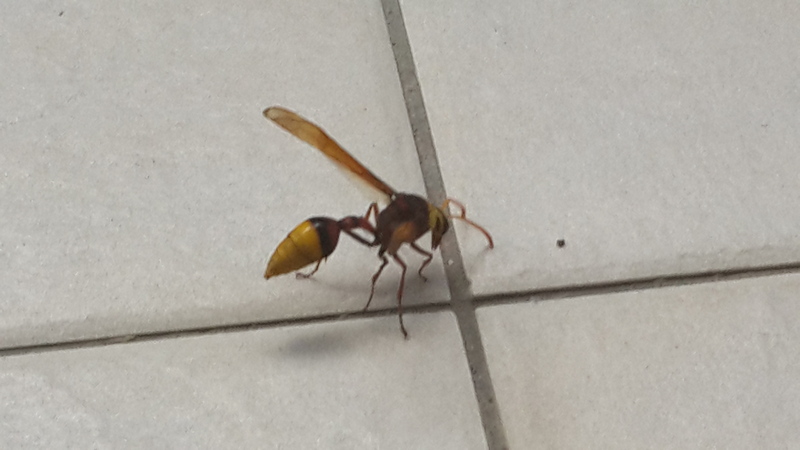 Note: this method worked because the hornet was just beginning to build. Definitely not recommended for a larger nest. Get professional help if you have a problem. 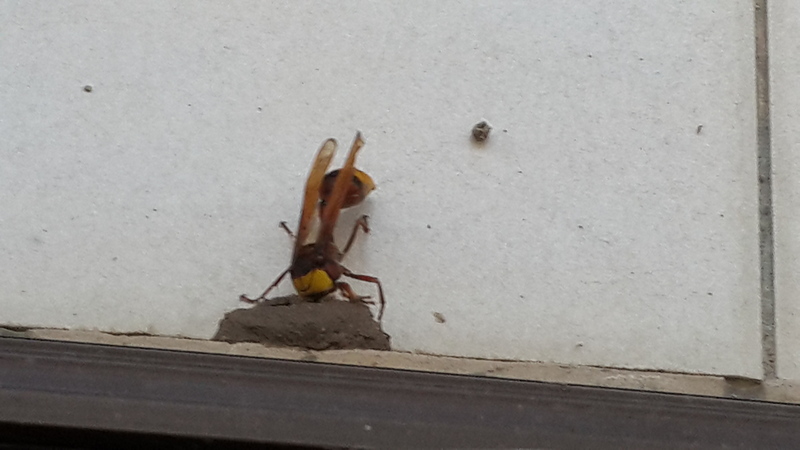 The hornet returned ten minutes later and began building a second nest a few meters away from the site of the demolition. Off it flew to collect more hornet bricks or clay or whatever for its new home. I demolished this one too, vacuumed the remains and poured vinegar again to throw it off the scent. The spot outside the balcony door was obviously well suited because it returned, searched for a few minutes, then began to build a third time. Remembering that firefighters sometimes use a blanket of foam, I covered the nest with a mound of a thick cleaning fluid and shut the doors. The two cats obviously knew that the insect was potentially lethal. 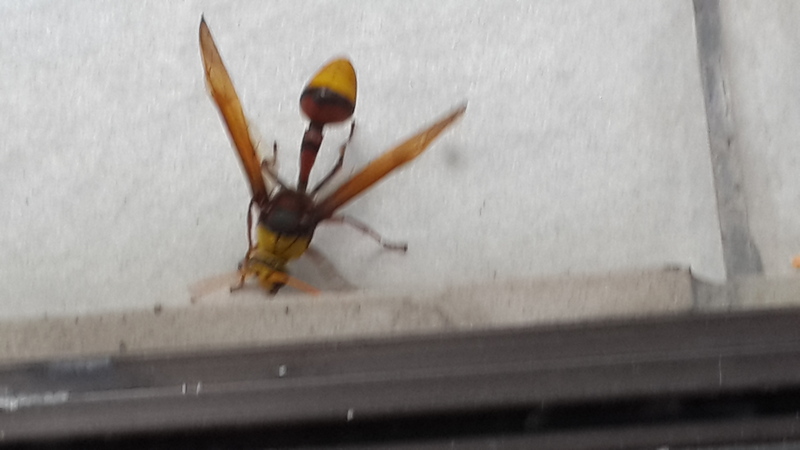 They watched with obvious respect through the glass doors as it buzzed about furiously outside before flying off to find a more suitable building site. Ah, the joys of living on a sub-tropical island paradise! As in the Bible, there are snakes in this paradise too. According to a book on the local flora and fauna, cobras, vipers, banded kraits and Burmese pythons are to be found here. However, snakes are shy creatures and in the past year of extensive hikes through the many trails on this island, I’ve only once glimpsed a vanishing tail at dusk. However, I’ve been repeatedly told that small animals, especially cats and dogs are at risk from the Burmese pythons.